"You strive very hard to keep up to date about what modern Russia is like and what its people and leaders are thinking," former New Zealand's Prime Minister, Helen Clark. Helen Clark, head of the United Nations Development Program and a candidate for the UN Secretary General, speaks about sustainable development, Syria, conflict prevention, trends in the Asia-Pacific region and Russia. Fyodor Lukyanov: The reason for most of the severe crises in today’s world is the inability of states and regions to guarantee sustainable development. The UN Development Program (UNDP) produces development reports on a regular basis. How do you, as the UNDP head, evaluate today’s situation regarding development in the world? 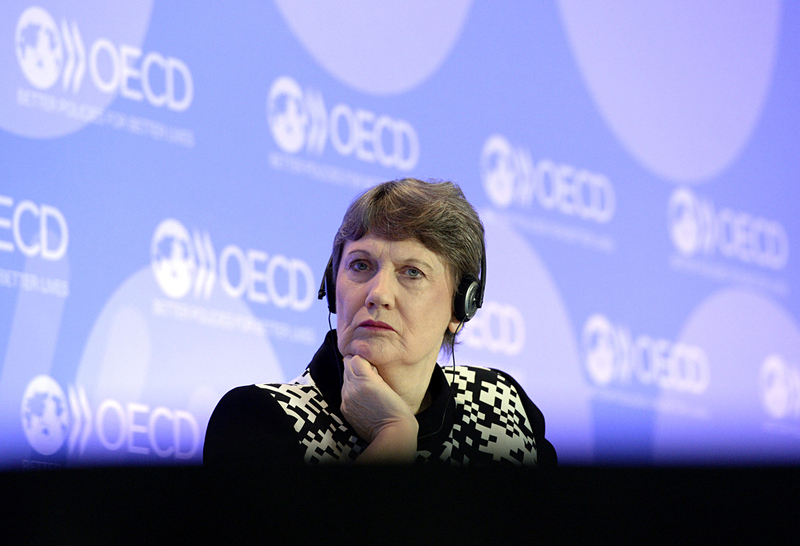 Helen Clark: Most issues that come before the Security Council relate to some underlying deficit in development. If we look at the particularly fragile states, we often see a mix of things. Extreme poverty is not there in a vacuum – there are problems of weak statehood and a lack of rule of law and order. Some of these countries are very exposed to natural disasters. These things put together cause troubles. These are the areas that the UNDP works on at a government’s request. We can help them strengthen public administration, strengthen the delivery of services, strengthen the justice system. We can help them develop the police force to work alongside and with respect to communities. There are many things that we can do alongside the socioeconomic work of inclusive growth and social protection. F.L. : Are you satisfied with the level of engagement by UN members and especially the big powers? H.C.: Sadly crisis and disaster attract resources one would so much prefer to have invested in stable societies trying to grow their economies, include everybody in it and improve their health and education systems. And yet, in the current circumstances so much of the development dollar is being diverted to other things, such as humanitarian relief. We are fortunate that in Syria a number of partners have been prepared to help, to restore water, restore the power supply, clear up areas, work to give youth opportunities, to empower women and work with the most vulnerable groups. We have had the money for all of that. And also in Iraq, in areas cleared of Islamic State control, the UNDP has a capacity, which is growing quite large, to support communities to come back and resume their lives again. But this comes at great costs to countries themselves and to the diversion of the development dollars from so many other very deserving parts of the world. F.L. : Are you satisfied with how the great powers contribute to the efficiency of the UN? H.C.: The UN works best when there is a minimum of friction between the great powers. When there is friction it becomes harder to get consensus in the Security Council. And I think that an important role of the secretary general is to always be trying to connect members and build the bridges that contribute to a climate of trust. F.L. : Trust is a scarce asset nowadays. Do you think the secretary general can be seen as a neutral body, equally distanced from all major players? H.C.: The secretary general definitely has to be seen as being able to stand above the differences within the Security Council and the UN membership. The secretary general’s role is to try to facilitate the member states themselves in reaching agreements. Being politically neutral is extremely important and for the UNDP this has been a fundamental principle while I’ve been there – the UNDP does not play politics at all. We pride ourselves on being able to work with our mandate on human and sustainable development across all political contexts. It is not always easy, but we do this. F.L. : Do you think that you understand the mood and logic of Russia, its leadership, its public opinion? H.C.: Prior to coming to the UNDP, I received my main exposure to Russia through the lens of APEC (Asia Pacific Economic Cooperation) and the Asia-Pacific economic community, which was a constructive experience, because what brought people together along the Asian-Pacific rim was a common interest in peace and prosperity. It was very focused on economic cooperation. Coming to the UNDP, one of the earliest things on my agenda was, by agreement with Russia, to actually close the UNDP country office [there] because it was not serving a useful purpose. And my view was that we, as the UNDP, needed to relate to Russia as a strategic and development partner, working with Russia in third countries. We were able to conclude a partnership framework agreement, to set up a Russia-UNDP trust fund. Those were [some of] the ways I [interacted] with Russia. If you go back to my student days, I studied the great powers at the university. We studied Russia and the Soviet Union and I studied a great deal about it. And then Russia went through changes, so you strive very hard to keep up to date about what modern Russia is like and what its people and leaders are thinking. One of the reasons for coming on this visit now as a candidate for secretary general is to get an up-to-date idea about what is on the minds of people who are researching and practicing Russian foreign policy. F.L. : What do you expect to happen in the Asia Pacific region by 2030? H.C.: Firstly, New Zealand will always want to have an inclusive trade arrangement. It has been negotiating the Trans-Pacific Partnership (TPP) agreement. In fact, the TPP negotiations were launched at the end of my time as prime minister of New Zealand and my government did the original Trans-Pacific Strategic Economic Partnership Agreement between New Zealand, Chile, Singapore and Brunei (Ed. signed in 2005). We embarked on these agreements with a lot of frustration because of the stalemates at the World Trade Organization (WTO) rounds. The preference surely is for the WTO to conclude a successor round to the Uruguay GATT round. And the fairest thing is to have a world trade round that includes everybody. In the Pacific, New Zealand was the first Western developed economy to negotiate and then conclude a free trade agreement with China. If a WTO round continues to be elusive, then a round in the Asia-Pacific, which comprises some 60 percent plus of the world’s population and would have enormous force. F.L. : Are not you afraid that the TTP could generate a new dividing line between China and the rest of the region? H.C.: I certainly don’t see it doing that for my country, because it has already a free trade agreement with China and I think the TPP needs be open for others to come in and be part of it as well.